The Taiwan railways offer discount passes similar to the famous Japan Rail Pass and Eurail Pass, but with more options and flexibility and smaller savings.If you intend to see the south of Taiwan, and do a lot of travelling in a short time (perhaps if you are here on business) then a rail pass will save you money and be more convenient. As Taiwan is such a tiny island, however, with such extensive and inexpensive public transport (including the excellent intercity bus system) the rail pass isn't for everyone. If this will be your first visit to Taiwan and you'll be here for under a week then I recommend staying in Taipei and the Northeast Coast (especially Jiufen and Jinguashi). And if want to go south and can reserve ahead on the High Speed Rail the 35% savings outweigh those of the rail passes. If you are coming from a nearby country and only want to see the West Coast then consider purchasing a ticket into Taipei and out of Kaohsiung (or vice versa). Be very weary, however, of most LCCs from Japan, especially Vanilla Air. 1. These passes must be purchased outside Taiwan. Travellers purchase an 'exchange order' from a travel agent overseas, and exchange this for a rail pass on arrival in Taiwan. Unfortunately so far they are only sold in a few countries (see below). This may be changing, however. 2. These deals are only available for foreign visitors on a tourist visa (not Taiwanese or foreigners with work/resident visas. What it Covers Unlimited travel on HSR trains for three days. unlimited travel on trains for five consecutive days. Two of these days can include high speed trains, with the rest conventional trains. three consecutive days. any three days within seven days. no reserved seats on Chu-Kuang or use of Tze-chiang (express) trains. use of and reservations on all conventional trains. Good for a whirlwind tour of the populated West Coast. a longer tour of the populated West Coast with stopovers. A whirlwind tour of the West Coast and lots of travel between small towns and cities. It's usually cheaper to buy tickets as you need them or use an Easycard. The HSR is a high-speed train ("bullet train") down the populated West Coast, from Taipei to Kaohsiung. The three-day passes cover these trains only. It's the most efficient and luxurious way to travel, but most stations are a long way from the city centres (cities of the future) so once commuting times are taken into account it doesn't always save much time for shorter trips. It's very worthwhile from Taipei to Kaohsiung or Tainan, however. These older trains operate around almost the whole perimeter of Taiwan, opening up the beautiful East Coast. The Joint Passes allow two days on the HSR and another three days on conventional trains (all within five consecutive days) to see the East Coast. The HSR (left) and conventional (right) trains. Day 5/6/7 Day 3 Last Train to Taipei: 22:12, or stop at Taoyuan for airport. By far the cheapest and best way to travel down the West Coast is to purchase your HSR tickets in advance here (select 'discount trains only'), with early bird discounts of 35% off. If you can't reserve in advance the 3-Day (HSR only) pass is the only one which offers savings for people following a typical tourist route, and it allows the convenience of being able to get on and off trains at will. It's a good option for businesspeople or anyone who needs to do a lot of travelling in a short time. No other passes offer any significant savings to those following the routes I recommend here. For most travellers neither of the joint passes are economic: it's better to just take the three-day pass (if any) and buy tickets for the conventional (TRA) trains when you need them, which allows a longer stop in Hualien (for Taroko Gorge) and the Northeast Coast (for Jiufen, Jinguashi and the Pingxi Railway). They may be good for business people who need to stop at many smaller cities not easily reachable from the HSR. For Chiayi → Tainan → Kaohsiung use conventional (TRA) trains (not covered). Prices based on local + Chu Kuang trains. 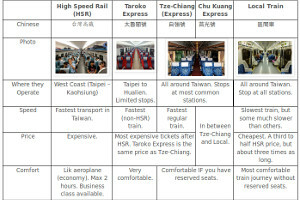 Prices based on Tze-chiang (express) trains. *Tainan and Kaohsiung are so close that it would be faster to take conventional trains or buses (because the HSR station is a 25 minute train ride from the central city) but prices shown here are HSR for comparison. TRA = Taiwan Railways Administration (non-HSR trains). The 3-day pass is good for a whirlwind tour of the West Coast, but if you have more time it's better to just reserve your seats in advance and spend as long as you'd like at Sun Moon Lake, Tainan and Alishan. The Express Joint Pass allows the user to ride and reserve seats on all trains (except local trains which don't take them). If you are willing to travel at off-peak times it's usually possible to get reserved tickets for a train that day, however reservations are often needed in advance between Taipei and Hualien. Of course it's much more comfortable to have a seat, but if seats are all reserved the extra NT800 is wasted. * it's okay to sit in a vacant seat until someone comes along with a ticket. The Joint Pass allows travel without seat reservations on Chu-Kuang (express) trains, but I don't recommend this as they're not much faster than local trains, and since all seats are reserved you'll end up standing in the crowded aisle or in the loud, crowded, hot, stinky gangway. Either get the Express Joint Pass and reserve tickets ahead, or get the Joint Pass and ride the slower local trains. Unfortunately there are no local trains between Kaohsiung and Hualien, so with a Joint Pass it will be necessary to stand on a Chu-Kuang for five and a half hours. More Time than Money? Go Local! If you are happy riding slower local trains and don't want to be locked into ticket reservations, ride the local trains. They are also very cheap, so most visitors would be better just buying tickets separately as needed, or using an Easycard, but the cheaper 5-day joint pass (or the Taiwan Rail Pass - see below) also work. They're relaxing and generally quite empty outside main cities, so it's usually possible to get a seat - and sometimes a carriage - to yourself. But they are significantly slower, usually by a factor of about a half. Local trains are the slowest rail option in Taiwan, but they are generally quiet and peaceful outside main centres, and they offer the flexibility of non-reserved seating. Students and concessionaires could consider the 5-Day Taiwan Rail Pass, or others in its class. These older passes allow unlimited travel for five days on conventional (TRA) trains. It's an excellent deal for students at NT600 (no reserved seats) and NT1250 for concessionaires (elderly, children and disabled). It's open to foreign students living in Taiwan, but eligibility and other rules are complicated. Other time periods are available, but are less likely to compete with the HSR passes for short-term visitors or just an Easycard. Check the Wikipedia page for more information. If you have time, get off the HSR tracks, escape the crowds and enjoy the stunning East Coast, with a Joint Pass or just purchase the tickets separately. Taroko Gorge is breathtaking, and considered one of Taiwan's top destinations. Taiwan High Speed Rail Passes can only be purchased outside of Taiwan. The official website only lists agents in Japan, China, Hong Kong, Macau and Malaysia. Australians can buy them from Taiwan Holidays. Otherwise it will be necessary to ask your local travel agent if they can source them. Hopefully more agents sign up to sell them in the near future. Taiwan Rail Passes, however, can be purchased in Taiwan, by anyone (including Taiwanese and residents). Not at all - you can go anywhere you like. How long will you have in Taiwan? we will have 6 nights, 13th - 19th June. Am finding a lot of the information confusing as seems to be in chinese english which isn't always easy to follow. If this is your first visit to Taiwan, and you don't have any particular special interests then I wouldn't get the rail pass. I would just spend about two days in Taipei, on in Jiufen/Jinguashi/Houtong, perhaps one in Jiaoxi, and one or two in Taroko Gorge (not a weekend). If you have particular interests (eg history, or hot springs) please let me know and I'll think of another suggestion which might involve the rail pass. This makes me realise that I should add a note on this to the page. You've probably already seen my page here, but I'll post it again in case you haven't (or in case it helps someone else). 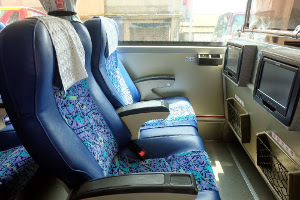 It's best to reserve the fast Taroko Express to Hualian, but for almost everywhere else buses are easiest (but not the only option). Unfortunately hotsprings in Taiwan are not nearly as good as Japan. You can still enjoy a soak at Beitou or Jiaoxi or several other places, but if you've enjoyed them in Japan you may be best to call that your hotspring experience and focus on something else in Taiwan. Just a thought. foreigners can buy the 3 day pass in taiwan from HSR stations? I've never heard of this, but it'll be great if it's true. Where did you hear this? I can check next time I'm at Taipei Main Station.